Would you believe this is a Crock-Pot recipe? This was so easy and came out amazing. the hardest part is getting it out of the crock-pot ( I cant believe me, miss clumsy was able to do it) very impressive dish to serve for a brunch or lunch with friends. My friend were amazed by this recipe especially the way it was prepare in a crock-pot. 1. coat crock-pot with non-stick cooking spray. Cut parchment paper to fit bottom of the crock-pot and press into place, spray paper lightly with nonstick cooking spray. 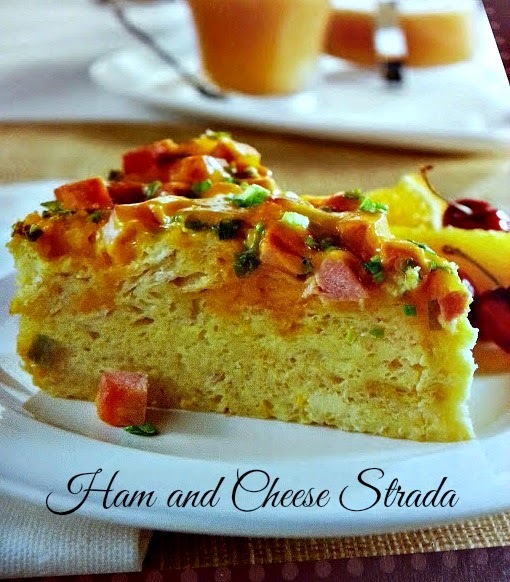 2. layer in following order , bread, 1 1/2 cups cheese, ham and all but 2 tablespoons green onions. 3. Whisk eggs, half & half, Worcestershire sauce and red pepper in small bowl. Pour evenly over layered ingredients in crock-pot cover; cook on low low 3 1/2 hours or until knife inserted into center comes out clean. Turn off heat. Sprinkle evenly with reserved 1/2 cup cheese and 2 tablespoons green onions. let stand, covered, 10 minutes or until cheese is melted. 4. To sever: run a knife or rubber spatula around outer edges, lifting bottom slightly invert onto plate and peel of paper . invert again onto serving plate. To fit the parchment paper I first traced the bottom of the stoneware, then cut the paper slightly smaller to ft. you can also use waxed paper.